a character or symbol (& or ) for and: Hansen & Associates. 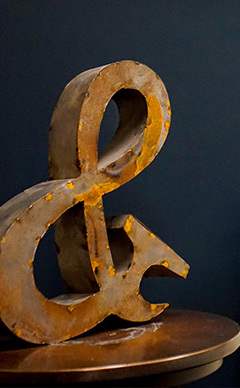 Ampersand is a logogram representing the conjunction word "and". The word was adapted in the 1830's from the phrase "and per se and" meaning in itself. The symbol is a ligature of the letters et, which is Latin for the word "and". At Hansen & Associates we feel the "&" in itself signifies the relationship with our patients, our team of specialists and each other. We are committed to giving the highest level of long-term dental health.